Halloween is my favorite time of year. I love everything about it – the costumes, the horror movies, the haunted houses, the candy. 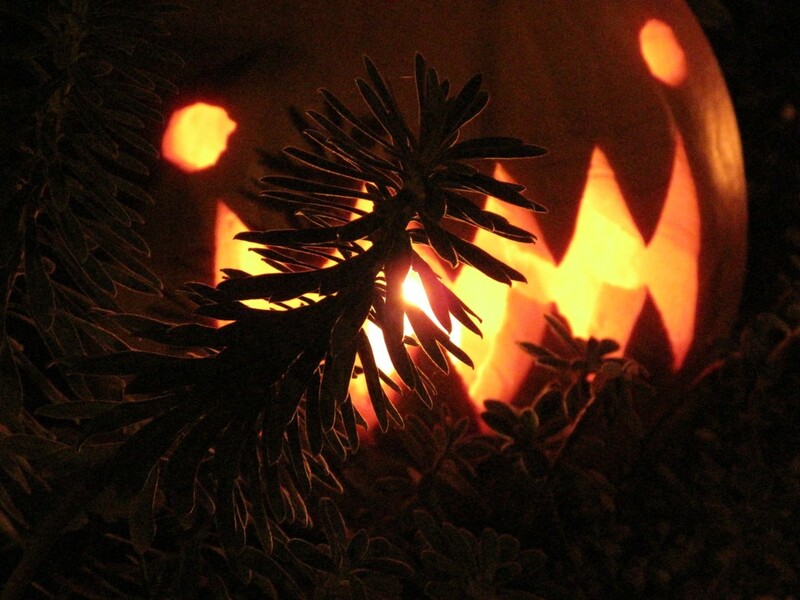 But my favorite thing is pumpkins, all lit and glowing, in my front yard garden on Halloween night. I have an illustrious group of friends who come over and carve – even though at a certain point, scooping out all the guts isn’t REALLY what you want to be doing when you are having cocktails! Still, they always persevere and help me put together a beautiful display on Halloween night. 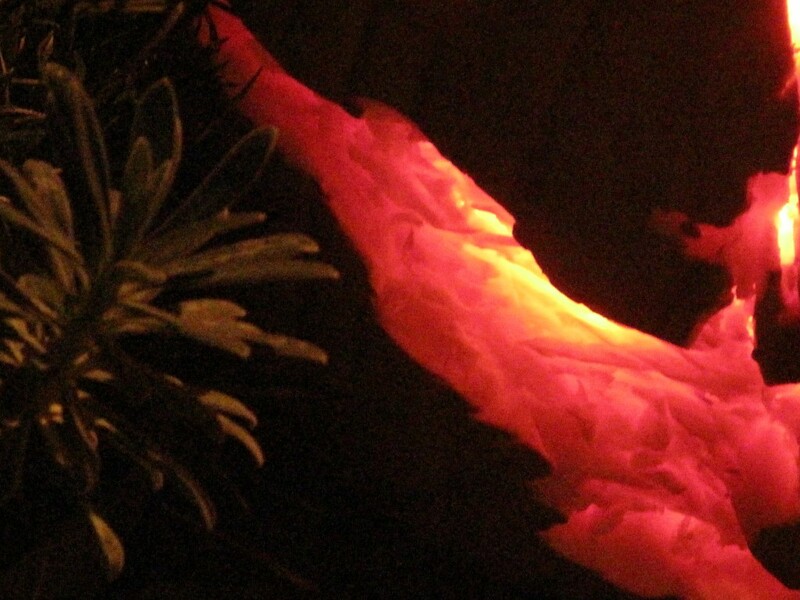 a jack o' lantern, or a lava flow threatening to engulf my sage? Plants are barely lit – they whisper in this light – their silhouettes are strong; dramatic. No matter what is carved on the gourd, the light washes the plants nearby and lends them something special, it is like they are sharing a secret. It is a more intimate space, where we have to look closely and risk getting scorched. It is fragrant – a garden that smells like holiday pie. It is fun, silly, delightful … and then it is gone. The magic of candles and pumpkins and flickering light is so fleeting, it is almost sad. As soon as the last flame is blown out on Halloween night, I think about the next time the garden will be this alive in the dark; this hotly scented, with dancing plant silhouettes, and this undulating, pulsing orange light that makes the world seem full of magic. Not soon enough for me. Oh god! You’ve just infected me!!! 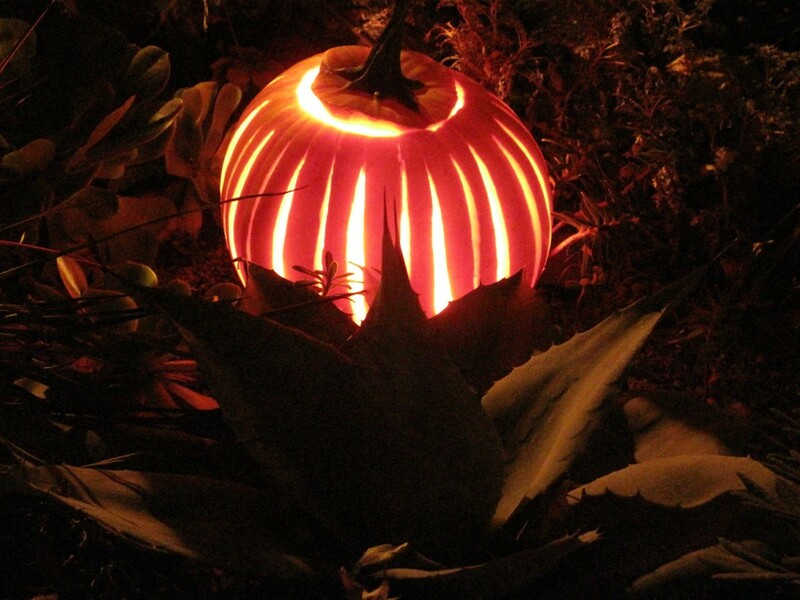 Now I know next Halloween I will be preparing to see my garden in this punkin glow. I only hope my friends will be so willing to help. You know I’m a big spook fan myself, and I love your glowing display. I so want to be invited to your carving party. I am agape, breathless, and simply enchanted. Get yerself a toddler – mine’s insisted on lighting the jack-o-lanterns every night since Halloween, even though they’re halfway to the compost pile. My favorite time of the year on your blog! Love the artistry of the jack o lanterns. 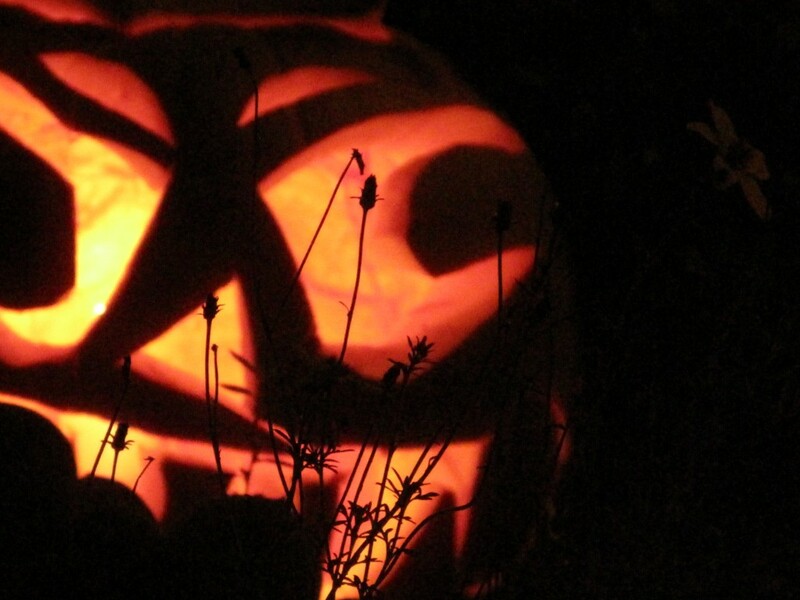 You and your friends rock when it comes to the pumpkins – thanks for sharing! I always love your halloween posts, Germi! 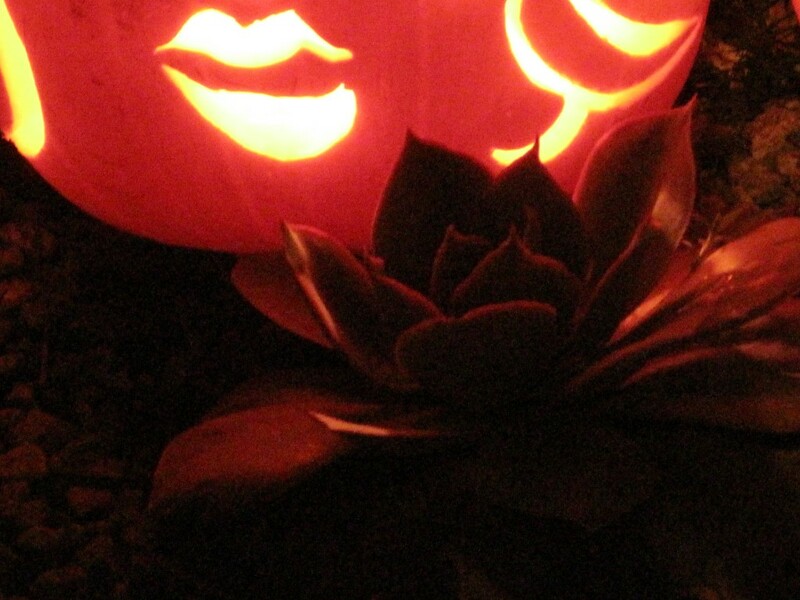 I, too, love halloween in the garden and your photos captured it all PERFECTLY!!! 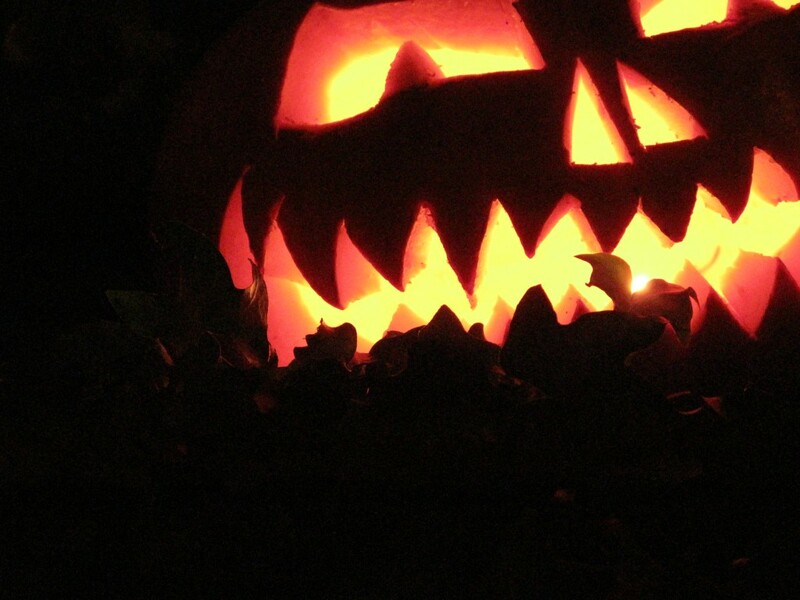 We were going to compost our own jack-o-lanterns today, but I think we’ll light them one more time, in honor of YOU! !